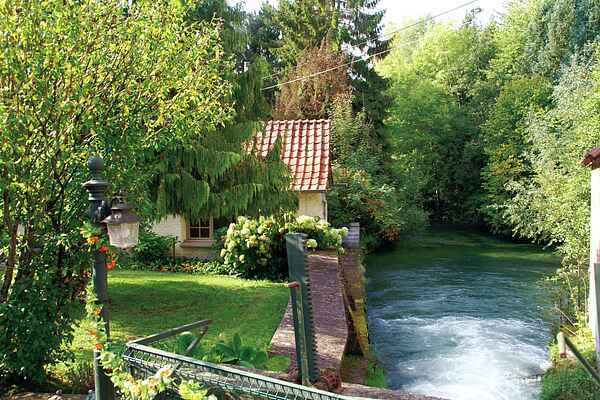 This holiday home is in an annex of the former watermill in the village Le Ponchel. This single-floor holiday home features a huge garden with many trees. Take in the natural surroundings from the terrace with seating area or while relaxing in one of the loungers. The only thing left to do is to enjoy the beautiful view and the calming sound of running water. Inside you're also one with nature; thanks to the large windows it almost seems like you're outside. The interior is very nicely furnished. For a walk in the forest you can go the Forêt de Crécy (18 km). And what about a day at the beach in Berck or Le Crotoy (both 43 km away)? Baie de Somme nature reserve (50 km) should not be missed. Here you can watch rare birds and wild horses. In the bay you could meet France's only seal colony! For cultural heritage you can go to Amiens (52 km), where you'll find Europe's largest gothic cathedral. Here it's great to shop and stop at an outdoor café. Also spend a day in the Louvre II, recently opened in Lens (72 km)!